Hannah joined the team in the beginning of 2019 as a post-doctoral research fellow focused on processing and analyzing microbial samples from corals collected on our Kiritimati trips. Centered around both the El Niño bleaching event and the human disturbance gradient on Kiritimati, the aim of her research is to investigate the influence of the microbiome on climate resilience in coral. Lia initially joined the lab in the summer of 2015 to help kickstart our eelgrass research program, bringing her wealth of coastal BC ecology and conservation experience with her. She began her MSc in January of 2016 and transferred up to a PhD in September 2018, co-supervised by Tara Martin (UBC). Lia's PhD is focused on the ecology and conservation of fish communities in BC, particularly Fraser River salmon populations. You can learn more about her research here. She is supported by the Pacific Institute for Climate Solutions and MEOPAR. Lia conducts her research in close collaboration with Raincoast Conservation Foundation. ​Jenny joined the Baum Lab in September 2017 to start her Masters research. 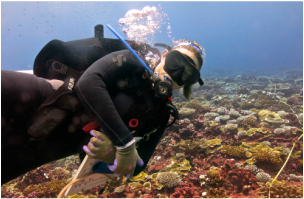 She is a member of the Kiritimati research team studying the tropical coral reef ecosystem and she visited Kiritimati in her first field season in June 2018. Her research centres around the mass coral bleaching event that left most of the reef bleached in 2016 following the record breaking El Niño. Jenny’s project aims to discover the role that herbivorous reef fish play in promoting reef recovery, primarily via consumption of turf algae and macroalgae. Niallan is assisting with image analyses of our Kiritimati coral reef community photos, benthic reef images, and coral recruitment videos. She is also assisting with South African BRUV analyses. Elizabeth is helping to analyze our benthic images of the reef at Kiritimati. Rebecca will be helping us analyze our coral growth colonies from the Kiritimati reef. Hannah analyzed baited remote under water videos (BRUVs) to investigate the effects of seasonality and protection of a fish and shark community in Betty's Bay, South Africa. Currently, ​she is helping us analyze our coral growth colonies from the Kiritimati reef. ​Allie is helping us to analyze our benthic images of the reef at Kiritimati. Rowen has previously assisted with our otolith analysis for Fraser River Estuary fishes. For her work study, she assisted with our South African BRUV analyses and is currently helping us analyze our coral growth colonies from the Kiritimati reef. Nelson is assisting with the analysis of our Kiritimati coral recruitment videos and South African BRUV analyses. For his honours thesis, Nelson will be investigating coral recruits before and after the 2015-2016 El Niño on Kiritimati. The study will build knowledge on how reefs recover after mass mortality events. Kelley is doing a Directed Study with Julia, in collaboration with former Baum Lab member Jillian Dunic. Kelley is studying the effects of environmental drivers on eelgrass (Zostera marina). Jessica will be helping us analyze our coral growth colonies from the Kiritimati reef. (Summer 2014, January 2015, Summer 2015).